Private commission, Omaru Bay, Waiheke Island. The striped, corrugated iron-clad tower references the traditional stripes on light houses of the Hauraki Gulf. The client commissioning the artwork required a space that could be a tranquil refuge for meditation and a sanctuary where a writer could work. The tower has two separate spaces with access to the upper space through a floor hatch. The upper tranquil space is five metres in height with horizontal macrocarpa structural ribs notched into the inclined corner posts that form a vertical visual mandala. Two cedar ladders placed on the east and west walls wriggle skywards, avoiding the windows and become both snake and ladder. The lower room is a sparsely functional space opening onto a series of wide and deep recycled hardwood steps that double as outdoor seating. The tower is solar-powered and is lit with LED lights. My architect husband, Mike, produced beautiful ‘Leonardo-esque’ detailed working drawings and project-managed the construction of the Tower. Dimensions: Height 8000mm x Width 4000mm x Depth 4000mm. The Tower tapers. Materials:Corrugated iron, cedar plywood, salvaged matai flooring, macrocarpa, recycled hardwood. 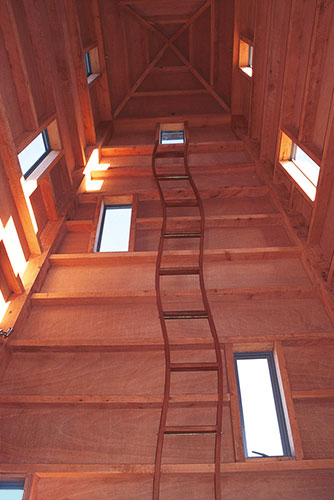 The internal ladders are laminated cedar, the roof is zinc.